Source: Asia and the United States. Handling Tips: Keep cool, 50° F and dry. General Information: One of the most praised of tropical fruits, and certainly the most esteemed fruit in the family Guttiferae, the mangosteen, Garcinia mangostana L., is almost universally known or heard of by this name. There are numerous variations in nomenclature: among Spanish-speaking people, it is called mangostan; to the French, it is mangostanier, mangoustanier, mangouste or mangostier; in Portuguese, it is mangostao, mangosta or mangusta; in Dutch, it is manggis or manggistan; in Vietnamese, mang cut; in Malaya, it may be referred to in any of these languages or by the local terms, mesetor, semetah, or sementah; in the Philippines, it is mangis or mangostan. The hard, outer shell should be cut carefully to expose the soft, white pulp within. The pulp looks like a tiny pumpkin and is in segments similar to an orange. The flavor is very sweet, flowery and tropical. 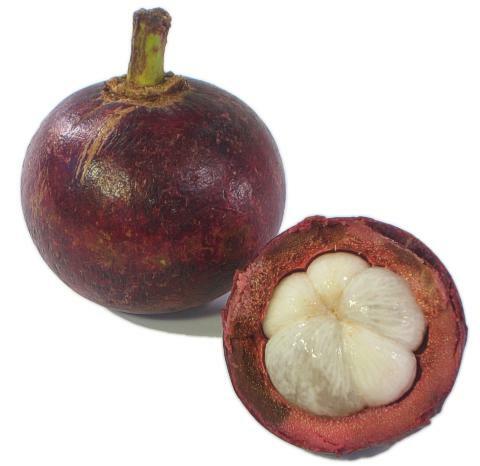 The mangosteen is rarely available for wide spread distribution in the United States. History: The place of origin of the mangosteen is unknown but is believed to be the Sunda Islands and the Moluccas; still, there are wild trees in the forests of Kemaman, Malaya. Corner suggests that the tree may have been first domesticated in Thailand, or Burma. It is much cultivated in Thailand–where there were 9,700 acres (4,000 ha) in 1965–also in Kampuchea, southern Vietnam and Burma, throughout Malaya and Singapore.